Questions about PC power management? Call our help desk at 818-832-6335. Reduce your PC energy costs by up to 40%. Left on all day and night, the average PC consumes more than 700 kilowatt hours (kWh) of electricity per year – more than the average refrigerator – and wastes almost 400 kWh when running at full power. EMA estimates that workstations account for roughly 90% of the total business power use. That means PC energy costs are the largest single contributor to overall IT energy costs and can account for a 25% of the costs in a modern office building – ranking just behind heating, cooling systems and lighting. Industry leaders know that computer power consumption is a big problem. On average over 50% of company’s computers are left on unnecessarily. Installation of efficient computers, monitors and other Green office items is part of the answer. 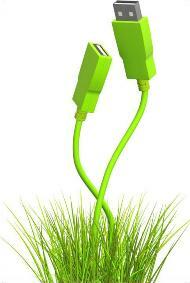 But the key to truly slash energy costs is PC Power Management Software (PPM). Simply put, PPM software powers up, powers down and powers off your PCs - automatically - to give you maximum energy savings. Using a PPM software solution is simple, inexpensive, and easy for organizations of any size to justify the investment. Effective PC power management gives IT managers the ability to control energy consumption by identifying where they are using the most energy, and how to reduce power usage with minimal interruptions to day-to-day. How much can you save? According to the US Environmental Protection Agency and US Department of Energy, a quality PPM package such as Powerwise can save upwards of $5,000 annually for a company with 100 computers. Why not make a purchase decision that will start saving money and the environment? Powerwise is a centralized power management software solution for Windows networks that provides maximum flexibility in managing PC settings based on activity, time, and day of the week. Powerwise is designed to provide a comprehensive set of tools and information to intelligently manage and control power settings for monitors, hard disks, and processors on a network to maximize money and energy savings. Powerwise powers down and powers off PCs automatically when not in use. Powerwise powers up and powers off PCs automatically to easily manage after hours maintenance needs to deploy patches or updates anytime of the day or week. Powerwise powers up, using Adaptive Wakeup technology and puts PCs in a ready state waiting for a user to start their day. Powerwise software is installed on a network server. A small agent is deployed to each PC to be managed on the network. Energy profiles are created for groups, or individual PCs to provide direction for the various events that are scheduled to take place during a day, week or month as required. Typically the Powerwise Server can be co-hosted on an existing server. A default Server installation requires approximately 70 MB of disk space & 40 MB of memory. The Agent requires 9MB disk space & requires approximately 10MB memory. Warning pop ups can be displayed prior to turning off a computer’s display, logging off a user, or powering down a computer. Copyright© 2004-2012 Uscan, Inc., a California corporation. All rights reserved.